The Old Mangers01263 715779work01603 870304fax Self-cateringThe Old Mangers, one of several comfortable cottages converted from farm barns with attractive beams and other original features, is situated in Tattersett, a village within ten miles of the lovely coastal towns of Brancaster and Wells in North Norfolk. Also available is a games barn and play area for children, and the town of Fakenham, with its great shopping facilities, is only five miles away. The Old Mangers offers weekly bookings starting on Saturday. 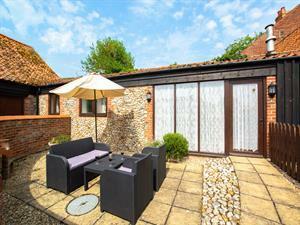 The Old Mangers, one of several comfortable cottages converted from farm barns with attractive beams and other original features, is situated in Tattersett, a village within ten miles of the lovely coastal towns of Brancaster and Wells in North Norfolk. Also available is a games barn and play area for children, and the town of Fakenham, with its great shopping facilities, is only five miles away.